Today, 24M emerged from stealth mode to introduce the semisolid lithium-ion cell, a revolutionary technology that solves the grand challenge of energy storage by enabling a new, cost-effective class of the lithium-ion battery. 24M’s semisolid lithium-ion is the most significant advancement in lithium-ion technology in more than two decades and combines an overhaul in battery cell design with a series of manufacturing innovations that, when fully implemented, will slash today’s lithium-ion costs by 50% and improve the performance of lithium-ion batteries. 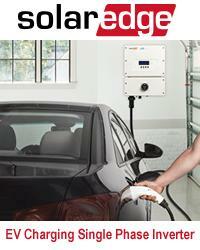 The technology will accelerate the global adoption of affordable energy storage. Until now, the energy storage field has had two options to try to drive down costs – build massive and complex factories to produce lithium-ion batteries in high volumes or pursue entirely new chemistries that may never move from the lab to the commercial floor. With the invention of the semisolid lithium-ion battery, 24M presents a third option – work with the world’s preferred energy storage chemistry and unlock new opportunities for cost reductions through new cell design and manufacturing innovations. 24M’s platform is the most significant advancement in lithium-ion technology since its debut more than 20 years ago. Per a media report, Trina Solar Limited is going to invest $500 million for building a 2-gigawatt solar module plant in India in partnership with Welspun Energy Ltd. The plant's output will be exported to the U.S. and European markets, which have imposed punitive trade duties on solar shipments from China. The facility will be built in either Gujarat or Andhra Pradesh. Construction of the plant will be completed in two phases over a period of about 18 months. Following in the footsteps of Tesla and Mercedes-Benz, Nissan is now set to become the latest automaker to offer battery packs for stationary energy storage. Although pricing information has yet to be provided, the Nissan product should be relatively affordable, as it will incorporate used batteries from Nissan Leaf electric cars. Nissan designed the battery packs as part of the 4R Energy joint venture with Sumitomo Corp., and has partnered with commercial energy storage company Green Charge Networks to manufacture them. While Nissan is the source of the actual "second life" lithium-ion batteries that no longer meet the demands of automotive use, Green Charge is providing the power management software. According to Nissan, this is the first time that used EV batteries have been commercially utilized for such an application. "A lithium-ion battery from a Nissan Leaf still holds a great deal of value as energy storage, even after it is removed from the vehicle, so Nissan expects to be able to reuse a majority of Leaf battery packs in non-automotive applications," says Brad Smith, director of Nissan's 4R Energy business in the US. Cont'd..
A new study has mapped out a potential plan for the United States to completely transition to clean, renewable energy by 2050. According to the research study leader Mark Z. Jacobson, a professor of civil and environmental engineering at Stanford, the process would demand significant upfront costs, but over time would be roughly equal to the costs of maintaining the fossil fuel infrastructure currently in place. “When you account for the health and climate costs – as well as the rising price of fossil fuels – wind, water and solar are half the cost of conventional systems,” Jacobson said. “A conversion of this scale would also create jobs, stabilize fuel prices, reduce pollution-related health problems and eliminate emissions from the United States. There is very little downside to a conversion, at least based on this science.” Among the positives of switching to clean energy: reducing air pollution in the U.S. that is responsible for approximately 63,000 Americans each year, and eliminating greenhouse gases produced by fossil fuel that would cost the world approximately $3.3 trillion per year by 2050, per a phys.org report. Stephen Edelstein for Motor Authority: Tesla Motors may be the first automaker to try selling standalone battery packs for powering homes and businesses, but it may not be the only one for long. Mercedes-Benz could soon enter the energy storage business as well. A division of parent company Daimler has been testing battery packs that can power houses or store excess electricity from the grid, and plans to launch commercially in September, according to Australia's Motoring. Called ACCUmotive, this division was created in 2009 to develop lithium-ion batteries. Like Tesla before its recent announcement, the Daimler arm has been testing energy storage systems under the radar for some time. It recently built an energy storage array operated by German electricity joint venture Coulomb. The array consists of 96 lithium-ion modules that together boast a combined 500 kilowatt hours of storage capacity, which is used to stabilize the Saxony Kamenz power grid. There are plans to expand it to 3,000 kWh of capacity. ACCUmotive has reportedly delivered more than 60,000 lithium-ion cells to customers—which may include Mercedes itself—and employs more than 250 people. Can bladeless wind turbines mute opposition? Mark Shwartz, Stanford Univ. : Stanford Univ. scientists have created a new carbon material that significantly boosts the performance of energy-storage technologies. Their results are featured in ACS Central Science. "We have developed a 'designer carbon' that is both versatile and controllable," said Zhenan Bao, the senior author of the study and a professor of chemical engineering at Stanford. "Our study shows that this material has exceptional energy-storage capacity, enabling unprecedented performance in lithium-sulfur batteries and supercapacitors." According to Bao, the new designer carbon represents a dramatic improvement over conventional activated carbon, an inexpensive material widely used in products ranging from water filters and air deodorizers to energy-storage devices. "A lot of cheap activated carbon is made from coconut shells," Bao said. "To activate the carbon, manufacturers burn the coconut at high temperatures and then chemically treat it." The activation process creates nanosized holes, or pores, that increase the surface area of the carbon, allowing it to catalyze more chemical reactions and store more electrical charges. Jeremy Thomas for Inside Bay Area News: In a christening hailed as a key moment in the effort to harness the sun's energy to create fuel, Lawrence Berkeley Lab officials on Tuesday unveiled a $59 million Solar Energy Research Center. Named after former Energy Department Secretary and Lab Director Steven Chu, the 40,000-square-foot Chu Hall will be a place of world-changing research in producing cheaper, more efficient renewable energy to replace fossil fuels, said Chu, who was honored for inspiring the mission. "This is one of the most important problems that science, technology and innovation really need to solve," Chu said. "It's a very big deal. ... We simply need to save the world, and it's going to be science that's going to be at the heart of that solution." The facility will be home to the Berkeley hub of the Joint Center for Artificial Photosynthesis, a Department of Energy-funded collaboration led by the California Institute of Technology that is attempting to create solar fuel as plants do by using sunlight and other catalysts to split water into hydrogen and oxygen gas and convert carbon dioxide into liquid fuels such as methanol and ethanol. The byproduct of producing such a fuel would be oxygen. By Jaclyn Brandt for FierceEnergy: � In April, DONG Energy signed an agreement to take over RES Americas Developments Inc.'s (RES) more than 1,000-megawatt (MW) development project rights off the coast of Massachusetts. RES had secured the rights to two leases from the U.S. Bureau of Ocean Energy Management (BOEM) in January. "The U.S. is an interesting market for offshore wind with the potential to become a significant area for future development," said Samuel Leupold, executive vice president of Wind Power with DONG Energy, said at the announcement in April. "We already have a number of post-2020 projects in our pipeline in North-Western Europe that we will continue to develop. With the takeover of the offshore wind development project in the US, we will broaden our geographical scope and follow the market potential outside of our current footprint." Leupold continued, "The site conditions are quite similar to those we currently work with in North-Western Europe which means that the project could be developed using well-known technology and logistics." Although the offshore wind market in the United States has many regulatory obstacles, Brostrøm said that there is also a lot of potential off the East Coast -- including good wind speeds and water depths. He also cited the efforts by BOEM to encourage wind development. Researchers at Finland’s Aalto University have achieved a record-breaking 22.1% efficiency for a nanostructured silicon, or black, solar cell. They accomplished this by overlaying a thin, passivating film on the nanostructures by a process known as atomic layer deposition, and by integrating all of the metal contacts on the cell’s back side. Perhaps the best part: Black solar cells work really well on cloudy days. “This is an advantage particularly in the north, where the sun shines from a low angle for a large part of the year,” said professor Hele Savin from Aalto University, who coordinated the study, in a statement. “We have demonstrated that in winter Helsinki, black cells generate considerably more electricity than traditional cells, even though both cells have identical efficiency values.” Using the aforementioned process, the team managed to beat their previous record by almost 4%, which is a stunning achievement. The new cells have a certified external quantum efficiency of 96% at 300nm wavelengths, which the team said shows that charged carrier surface recombination is no longer a problem — and that for the first time, the black silicon isn’t limiting energy conversion efficiency. And thanks to the inherent properties of black solar cells, they can capture solar radiation at low angles, generating more electricity over the full duration of a day as compared with traditional cells. U.S. energy secretary, Dr Ernest Moniz, spoke at the Opening General Session at AWEA’s WINDPOWER 2015 event today in Orlando, Florida. Moniz stressed that wind power is an important and necessary part of the solution to climate change. Wind could provide five times what it provides today, he said, with a goal of one trillion kilowatt-hours per year in America. To get there, new technologies are needed to boost the industry is areas where it is not yet cost-effective or as profitable as other energy sources. Moniz mentioned better siting methods, improved drivetrains, and longer blades. On the show floor, companies are certainly bringing some new and improved technologies to the wind market. Click here for the full Summary from WindPower Engineering. Scientists in South Korea have developed a new way to store energy that also offers a solution to a growing environmental problem. Reporting their findings in the IOP Publishing journal Nanotechnology, the research team successfully converted used cigarette butts into a high performing material that could be integrated into computers, handheld devices, electric vehicles and wind turbines to store energy. According to the study, this material outperforms commercially available carbon, graphene and carbon nanotubes. It may someday be used to coat the electrodes of supercapacitors: electrochemical components that can store extremely large amounts of electrical energy. "Our study has shown that used cigarette filters can be transformed into a high performing carbon-based material using a simple one step process, which simultaneously offers a green solution for meeting the energy demands of society," says co-author Professor Jongheop Yi of Seoul National University.